Is the new Notre Dame ready for prime time? And in the seventh week, Brian Kelly and his Fighting Irish rested from all the work they had done. Kelly saw the progress they had made, and behold, it was pretty darn good. The season's first true playoff elimination game delivered. Notre Dame is in the mix for the top four. USC is not. The Irish completely outclassed a sloppy Trojans team, storming out to a four-touchdown lead en route to a 49-14 win at raucous Notre Dame Stadium. Coach Brian Kelly's team applied a familiar formula -- big-chunk runs with a bevy of ball carriers, opportunistic defense and timely passes -- to record its fifth straight win, and its first over a ranked opponent. Julian Love returned his second interception of the season for a touchdown and running back Josh Adams had another big day, rushing for 202 yards, to help No. 9 Notre Dame beat 14th-ranked North Carolina State 35-14 on a blustery Saturday. It's Halloween, which means it's Nick Saban's birthday. What do you get the guy who has five national championship rings, a seemingly indestructible machine of a program ranked No.1 and is the sport's highest-paid coach? Well, we don't know, either. So rather than try to figure it out, we're just going to tell some of our favorite stories about the coach, including a bunch you likely haven't heard before. On a perfect October night, Notre Dame players and coaches gather in the northwest corner of Notre Dame to sing the alma mater after their biggest win over rival USC in 40 years. But they aren't the only ones celebrating. U.S. Secretary of Defense James Mattis earns an annual salary of $207,800, according to public records. He oversees a department whose massive budget recently listed $8.2 billion for the Missile Defense Agency and $403 million for tactical Tomahawk cruise missiles. As much as it hurts for me to say this, But Miami sure was a lot better than Notre Dame last night in Miami. An argument between an Alabama and Auburn fan Monday over which team is better escalated to the point of gunfire, Mobile (Alabama) Police said. According to police, the Alabama fan shot the Auburn fan outside of an Extenda Suites motel around 7 p.m. on Monday. Jarrett Stidham passed for 237 yards and ran for a fourth-quarter touchdown and No. 6 Auburn beat top-ranked Alabama 26-14 Saturday with a berth in the Southeastern Conference title game on the line. It looks like we could have an all SEC championship game this year. I’m not sure how I feel about this. Alabama did have a better overall record but Ohio State had a fantastic season as well. Arguments could be made for both sides. Government is not the solution to the problem. Government is the problem. Ronald Reagan. Holy cow, the Georgia-Oklahoma game was awesome. I'm exhausted just from watching. Both teams played their hearts out-- it's a shame one had to lose. ThreeMustangs wrote: Holy cow, the Georgia-Oklahoma game was awesome. I'm exhausted just from watching. Both teams played their hearts out-- it's a shame one had to lose. 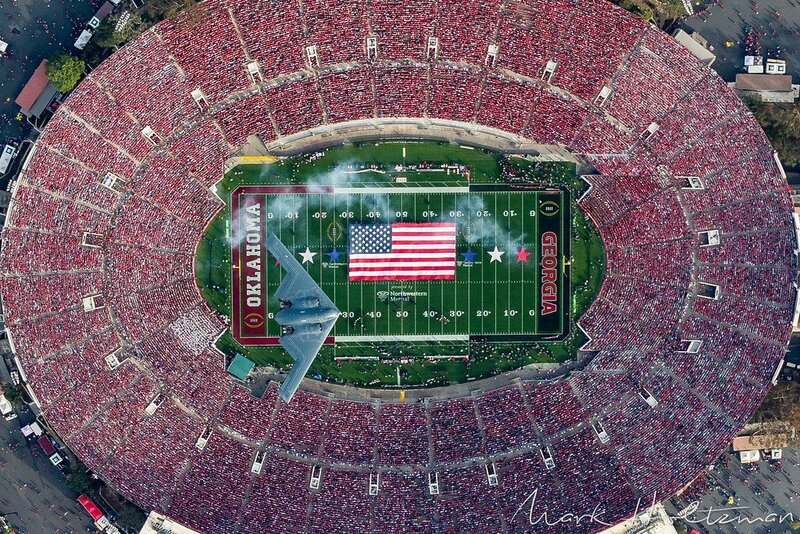 Thought this was a pretty cool photo. Sparrow Castle wrote: Thought this was a pretty cool photo. The Nick Saban Decade began in Atlanta in August 2008 with a 34-10 victory over No. 9 Clemson so one-sided that Tigers coach Tommy Bowden came out and said his team had been "whipped about every way you get whipped" -- a remarkable thing for a coach to say. Whoa Nellie - Heaven is getting a great one. 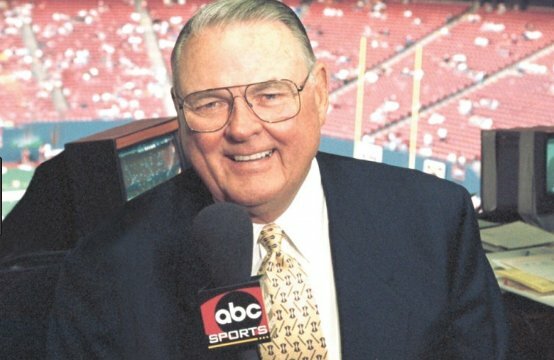 The great Keith Jackson has died. Rest in peace. Very sad to hear about the passing of Keith Jackson. He was one of the greatest announcers of his time.